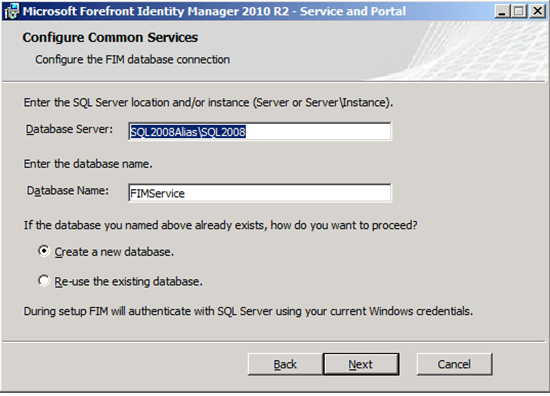 The purpose of this document is to provide an illustration of how to install Forefront Identity Manager 2010 (FIM 2010) where you need to install using a different SQL Server port. We can accomplish this task by using a SQL Server Alias. By default, FIM 2010 communicates to SQL Server using port 1433. Often there is a desire to configure SQL Server to listen on a non-default port. 1. Install the Full-Text Search feature for the SQL Server instance. 2. Create a SQL Server Alias (http://msdn.microsoft.com/en-us/library/ms190445.aspx). 5. Create a DNS record (A Record) for the alias and use IP Address of the SQL Server.